The silkworm was referred to by E.A Butler in his book ‘Silkworms’ as ‘Dog of insects’ due to their domestication of such wild animals for mankind. 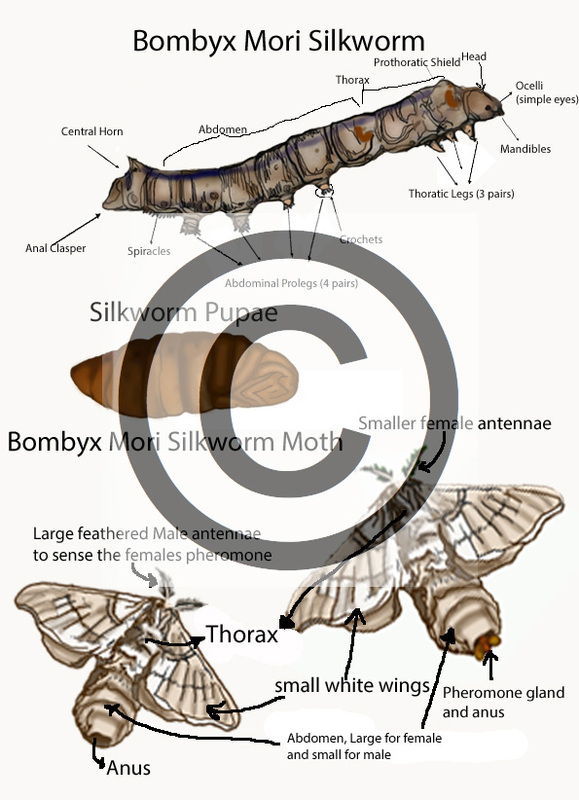 The silkworm Bombyx Mori named after the mulberry genus Morus – due to it being it’s main food source! White Mulberry being preferred- silkworm hatch lings jaws are so tiny that they can not eat the older course black mulberry leaves (as they are far courser than the white). However if you only have access to black mulberry as it is more readily available then when feeding the hatchlings, just make sure that you feed the worms the smallest, new leaves from the tree. you can also buy mulberry tree’s from many nurseries so if you are planning to rear silkworms for a number of years- maybe a school project then having one on your own premises is a good idea- the berries are really tasty! and make great jams!!! if you can get there before the birds! 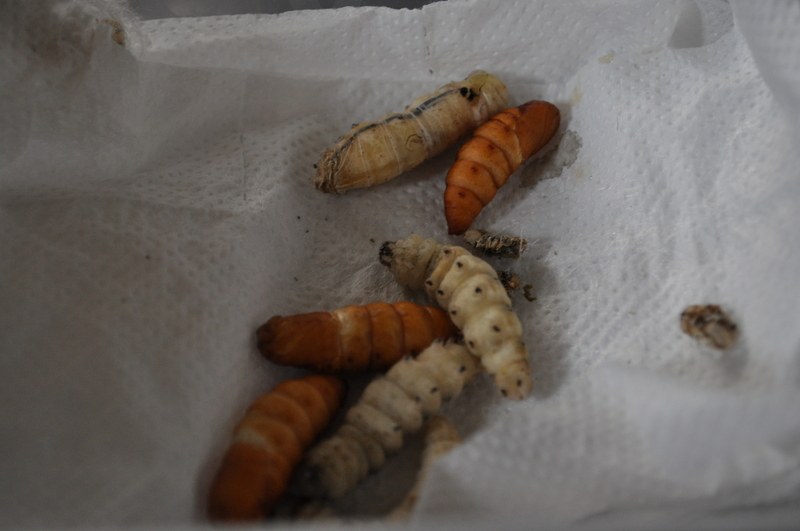 This is the silkworms version of microwave food. Due to the mulberry tree being deciduous (loosing their leaves in the winter- around November time). 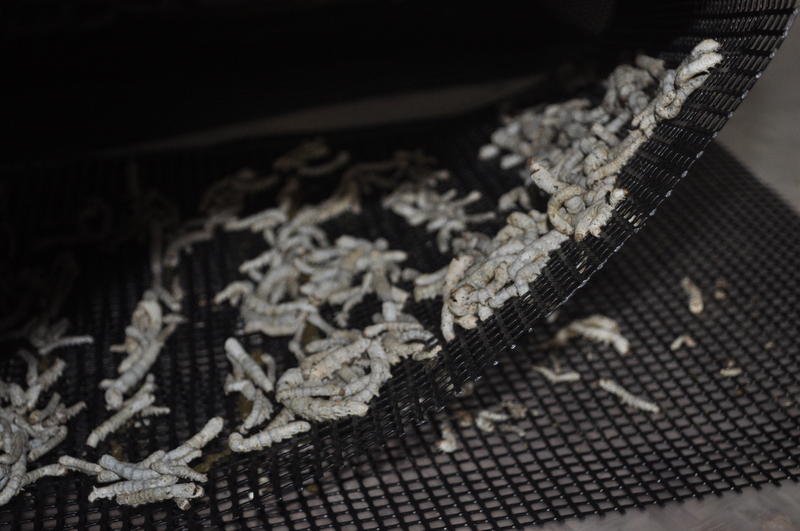 Microwave food has been made so that silkworm rearing can continue through the winter months! 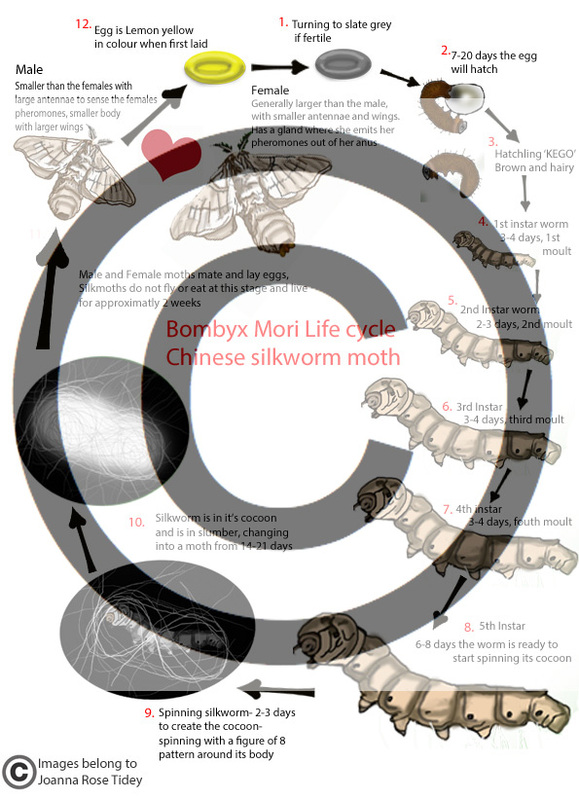 Silkworms only eat mulberry leaves and/or artificial silkworm diet (Silkworm Chow). IN AN EMERGENCY you are able to feed silkworms on Lettuce, dandelion and vine leaves. 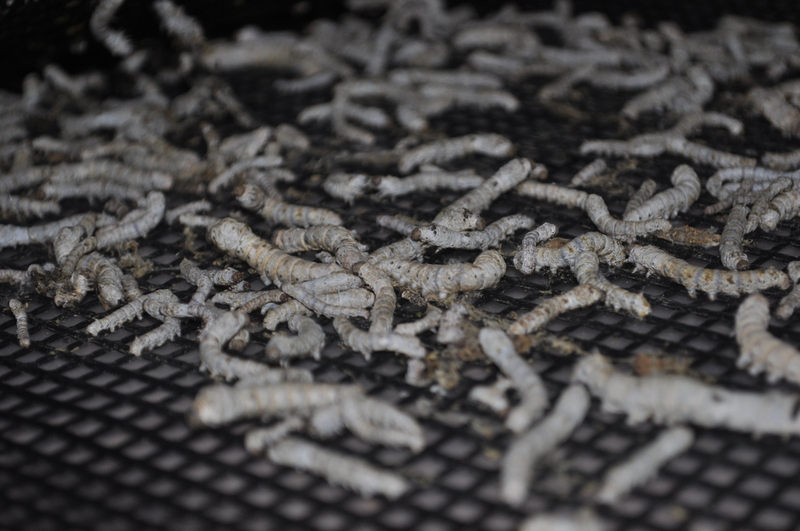 This will not harm the silkworms short term while you source more food- however do not provide the correct nutrients for the silkworms to produce their cocoons, therefore should not be feed these for long duration of time in their later instars. Please note that, once you change silkworms feed from mulberry chow to fresh leaves, it is very difficult to change them back to mulberry chow- not impossible, but it is like you have been fed microwave food all your life, then someone feeds you a fillet steak! If you do change the food from leaves to chow- you will need to remove ALL leaf and stalk matter from their home. They may not eat it so persevere for 2 days and they should begin to eat the chow. If the containers housing the worms are not clean, and hygiene not upheld, mould can develop, spread and kill the whole colony of worms. If mould develops, place netting/ mesh over the worms, pipe chow or place leaves all over the worms with a cheese grater. about half an hour later, as the worms crawl to the top of the new chow/leaf pile. 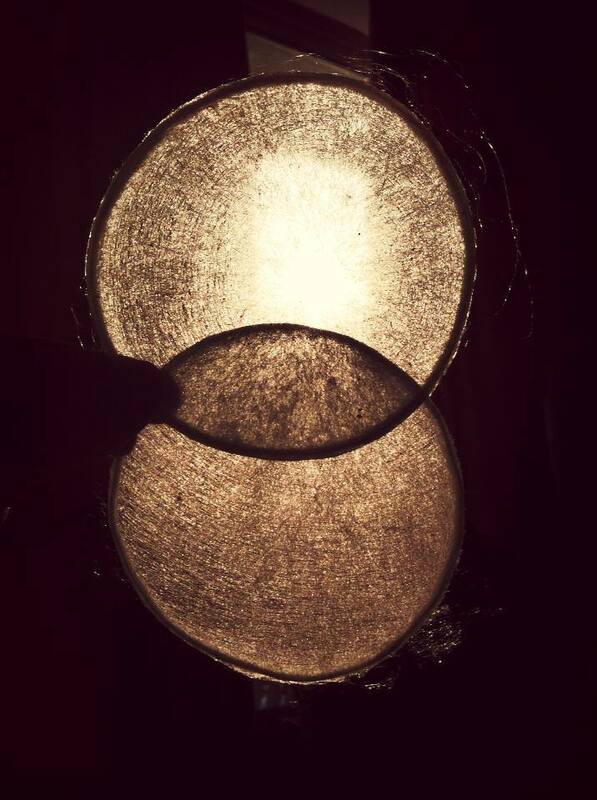 You can lift them off the mouldy chow using the netting/mesh and place them into a clean container. If you feed the worms the correct amount, so that all the food has been eaten between feeding, and the area is well ventilated, you will be able to avoid mould. 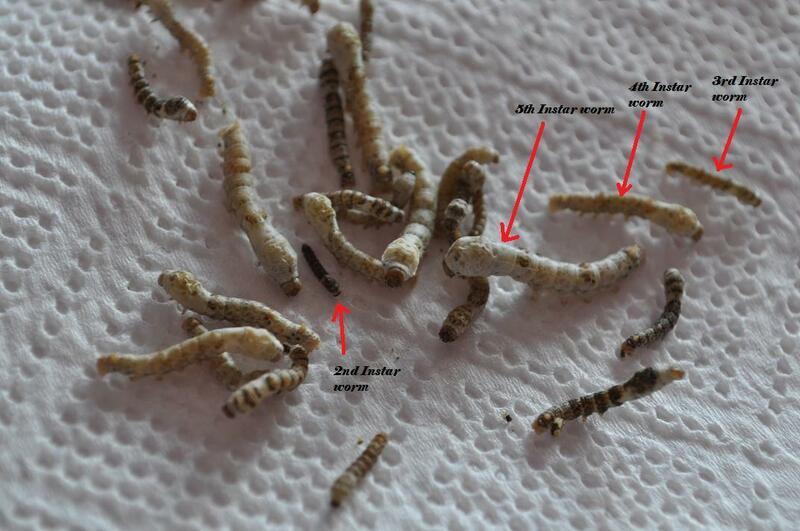 These are the stages of larval development; there are 5 of these between hatch and cocoon. The worms shed its skin 5 times throughout its life as a silkworm, due to growth. The Legend of how the silkworm came to Japan states that there are 4: the time of the lion, of the eagle, of the canoe, and of the courtyard. After the first two instars (which last 4-5 days,) each successive instar lasts about a week- the last being the longest- This is when the worms eat up to 80% of all the food in their life! Just hatched!- 1st instar silk worm hatching out of it’s egg! 1st instar worms are called Kego’s- which in Chinese means hairy babies- these are tiny! to see them properly you need a magnifying glass! Second and 1st instar. 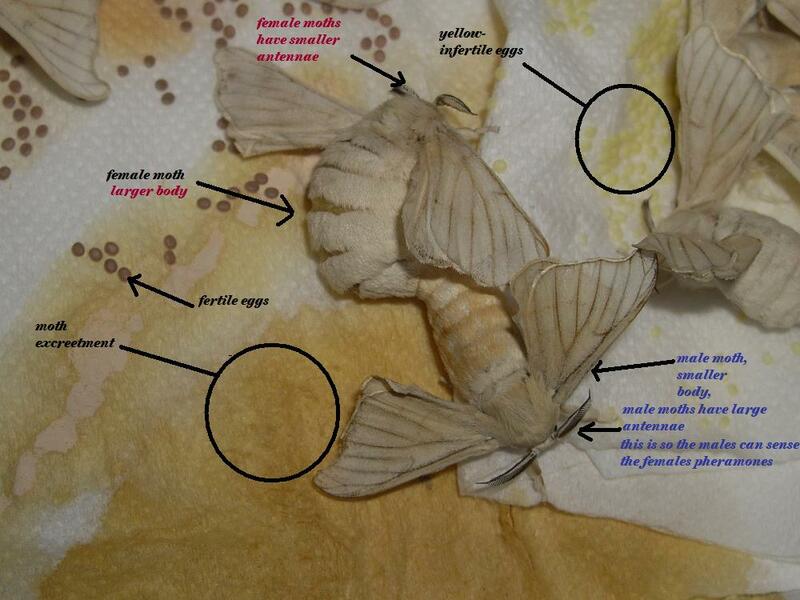 in the photo below, you can see that the eggs that have hatched are translucent white coloured. The 1st instar worms are dark, hairy and smaller than the second instar worms, who are no longer hairy, their heads are larger with a white neck. These worms are on Mulberry chow.. 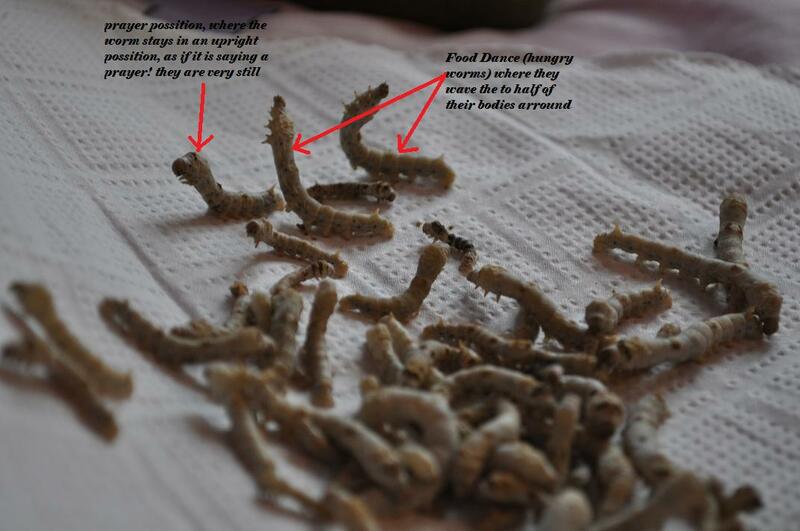 It take worms about 3-4 days to make a change from 1st instar worms to second instar worms. During each instar, the silkworm sheds its skin, they will spend several hours not eating, sitting immobile with their heads upward in a prayer position. They will have anchored themselves with some silk to the surface of the tray or leaf and wriggles forwards out of the old skin. 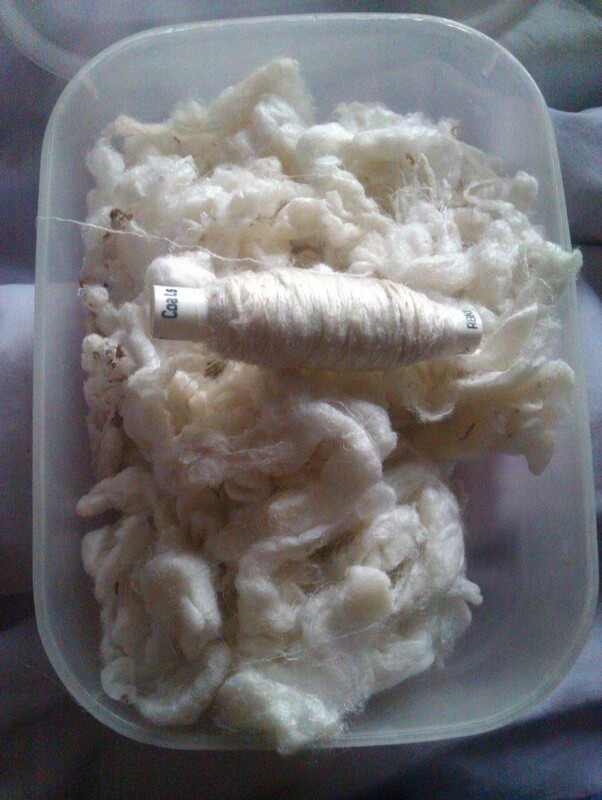 Afterwards, you find the shrugged-off skins attached to a silk thread on the bottom of the tray or attached to a leaf- silkworms do not only produce silk when making their cocoon- you will find a lot of silk in their container and on their old food throughout their life cycle along with their shed skins! 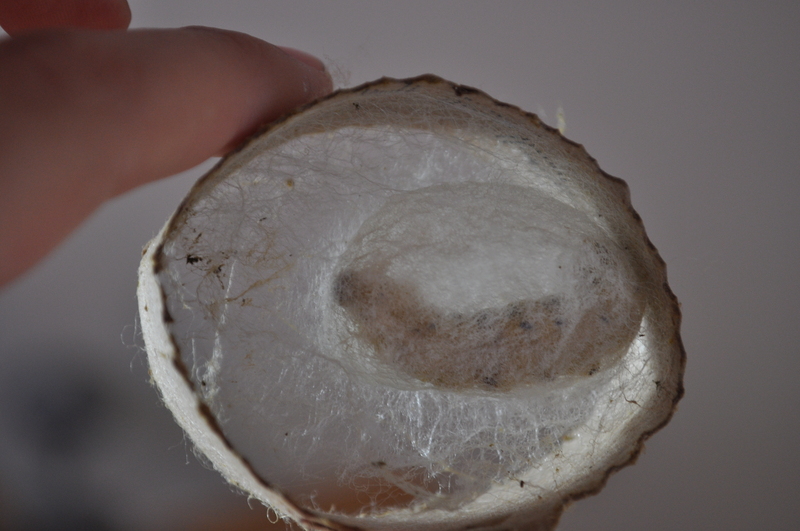 Video of one of my silkworms spinning its cocoon! 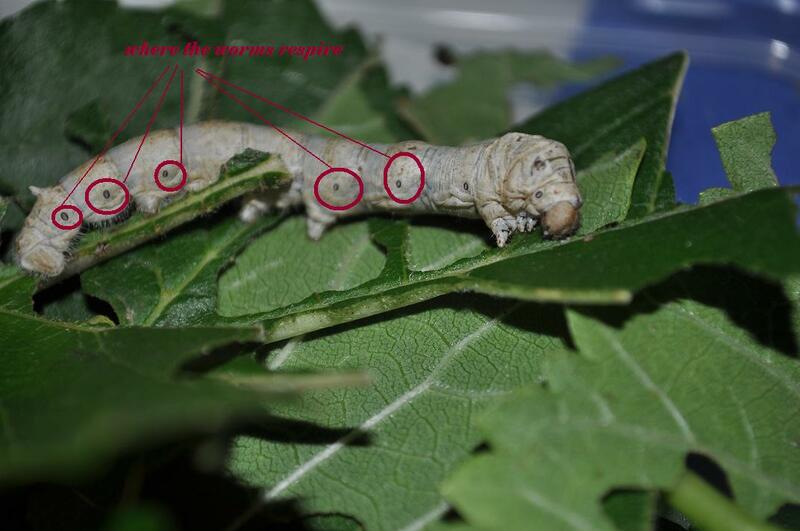 In 4-5 weeks, when they have reached to at least 2 inches, you will observe a change in the worms (the 5th instar). The worms will stop eating, similar to when they shed their skin. The worms will reduce in size (shrink), change colour slightly to a yellowy translucent colour. And make their last excrement (which can be pretty messy!- sometimes its very wet, other times you will notice they poo a light coloured nugget!. 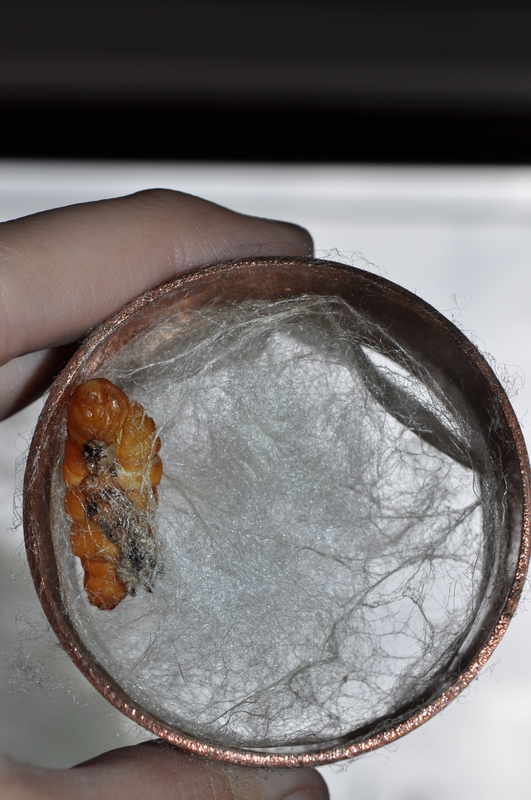 Below is a photo of cocoons that have been spun by silkworms within copper tubing- toilet rolls work really well for this! 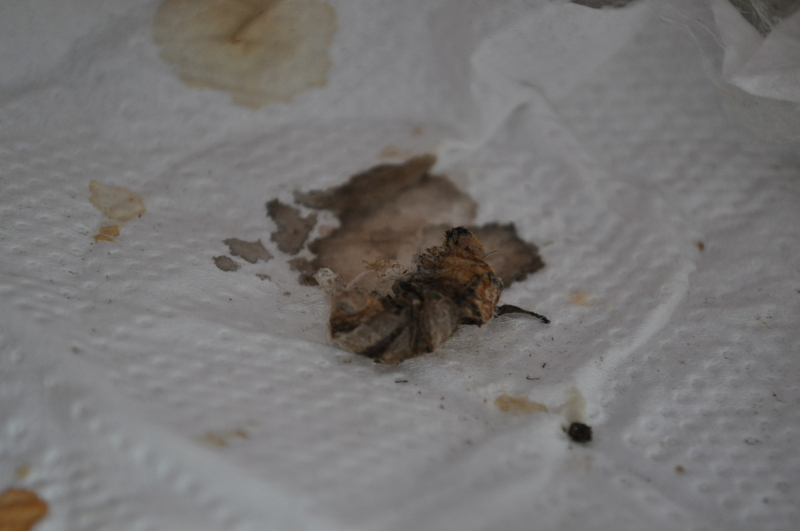 in the photo above there is a silkworm that was disturbed whilst making it’s cocoon. This will not produce one that will cover itself, instead it has covered the copper tube and will pupate without it’s silk casing. 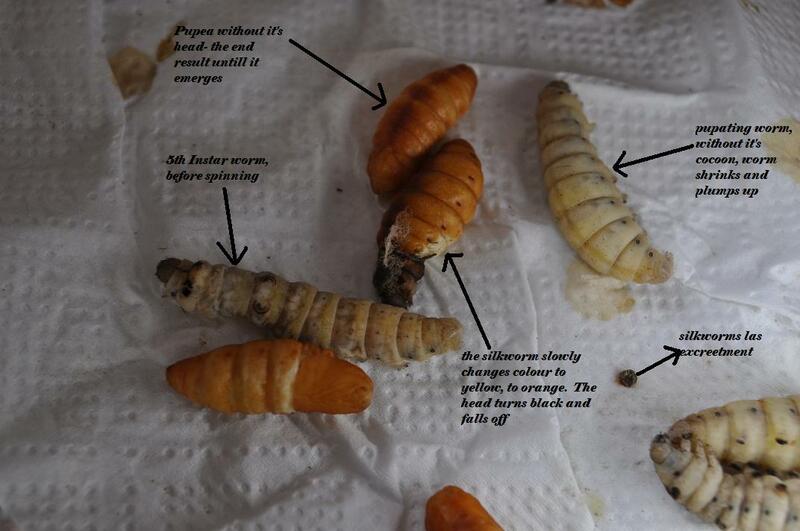 This pupae will slowly turn orange, to then dark orange. Its head will fall off. This pupae will still emerge, it just doesn’t have its little house. Once you notice a change in the worms- they have pooped and they start to cradle themselves by spinning a small amount of silk once they have shrunk slightly and turned yellowy tinge. Place the worms on a card cut out. I chose a circle but you can use other shapes such as hearts. Place the card shape on a bottle by tape the underneath. You need to create a big enough over hang so that the worm is on its own little island and can not limb off. Place your worm on the card which is on top of the bottle and the worm should start to spin flat on top of the shape instead of a cocoon. you are then able to peel off the silk from the card to reveal a beautiful silk shape! I believe this due to when de-gumming the cocoons which involves removing the sericin- all cocoons- including those that are yellow/apricot and lime green in appearance- then become white! Once the moths have completed their cocoons, roughly two- two and a half weeks later, moths will emerge. They do not eat, drink, or fly. They will mate and lay eggs then die within a week or two (depending on if the moths have a staggered emergence). When the moths emerge they secrete an emzym that disolves the sericin, creating a little whole so they are able to crawl out and begin their adult moth life! 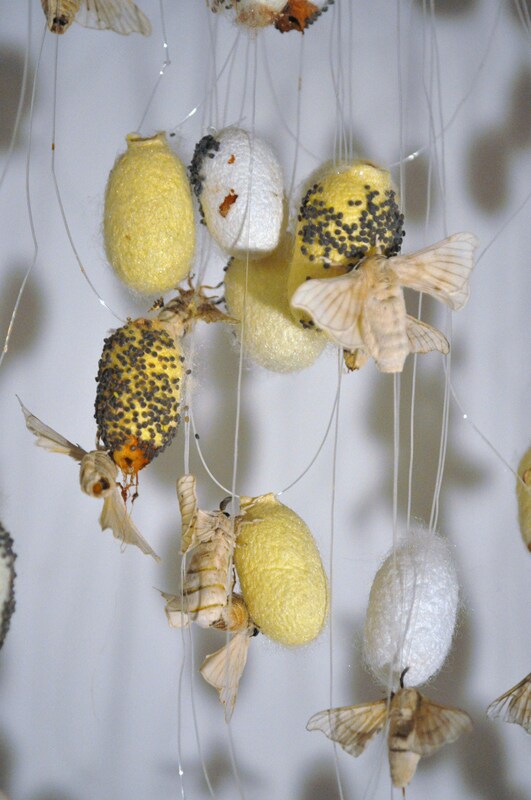 In the silk trade adult moths do not get to emerge, due to the fact that when emerging, the moth breaks the single strand of thread making the thread difficult to spin and and reel off to produce silk thread- so they get boiled or steamed once in cocoon state! The moths squirt out from their bodies brown fluid – they’re especially likely to squirt when excited or startled. The moths use the fluid to inflate their limp wings when they emerge; once the wings have hardened, the worms excrete it as waste- That or i like to believe it is like when a human goes to sleep for a very long time- once woken up needs a wee…. 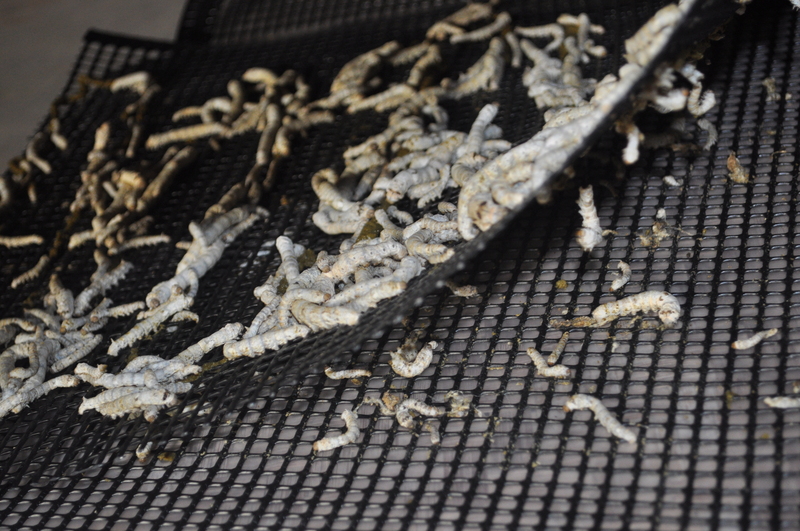 Silkworms are susceptible to bruising and dying if not handled with care, especially as they grow larger. When handling and transferring the worms, be very gentle. 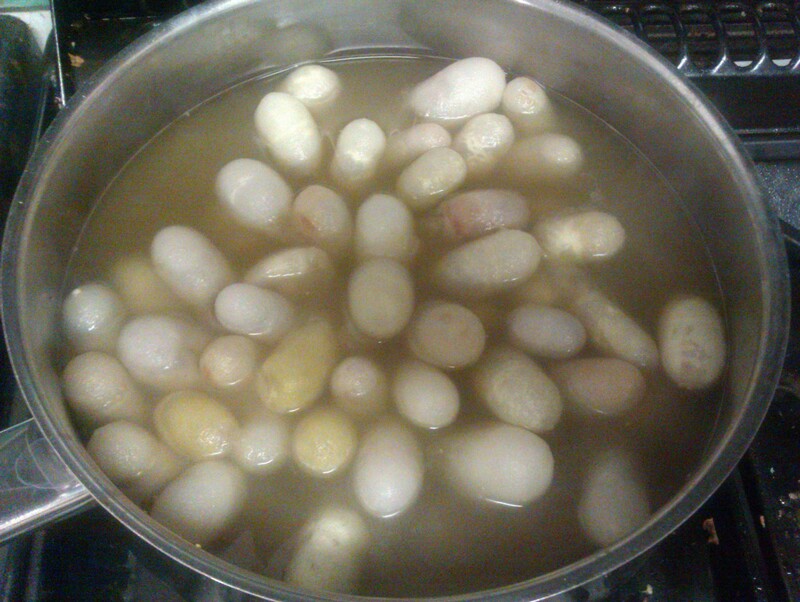 Do not drop silkworms from a height of more than an inch or two. Always wash your hands before handling the worms. The amount of leaves to feed the worms changes as their size increases and temperature. Feed them twice a day to sustain them. Make sure leaves are washed and dried before feeding. The general rule is to make sure that you give the worms enough leaves to cover them physically. However, you need to make sure there is enough room for them to move around the container- every worm needs to be in close contact with a leaf. Put the bagful leaves away in the fridge when you have finished feeding them. leaves last up to 2 weeks in the fridge in a ziplock bag. The chow should be stored in the fridge. 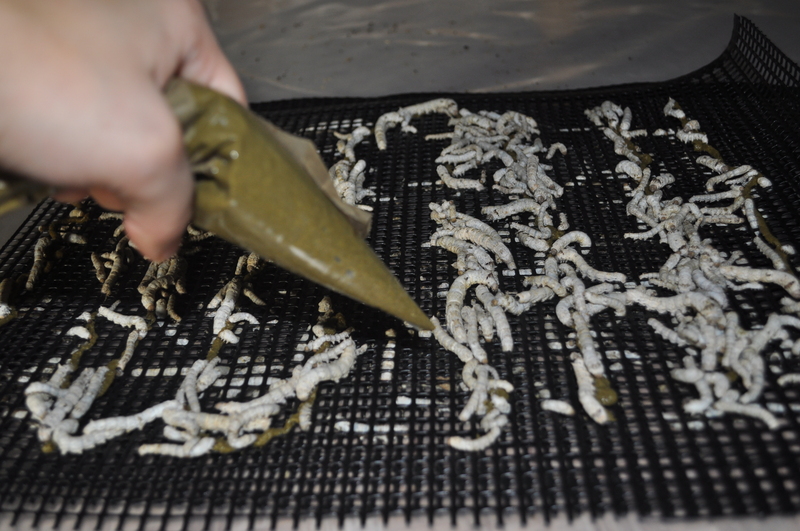 ALWAYS allow old chow to dry before feeding new chow- this prevents mould, the piping bag way is the easiest- as it means the chow has less contact with the air and hands- therefore is the most hygienic approach to feeding the worms! Wash hands thoroughly before handling the worms or food, or this may induce bacteria- worms have a very weak/no immune system- therefore this can cause viruses and death.. Always allow the old food (Mulberry chow and leaves) to dry out before re-feeding- as the worms will not want to find new food if they already have food in easy reach! 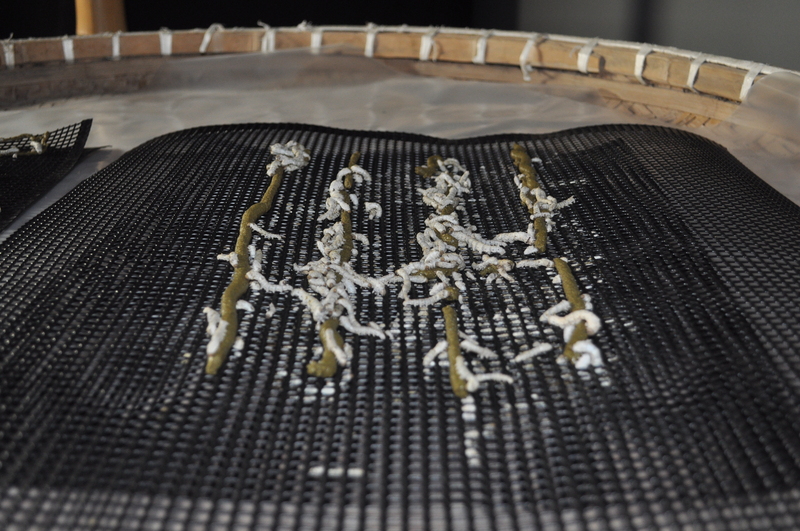 Within half and an hour, worms should climb through the netting onto the fresh food. 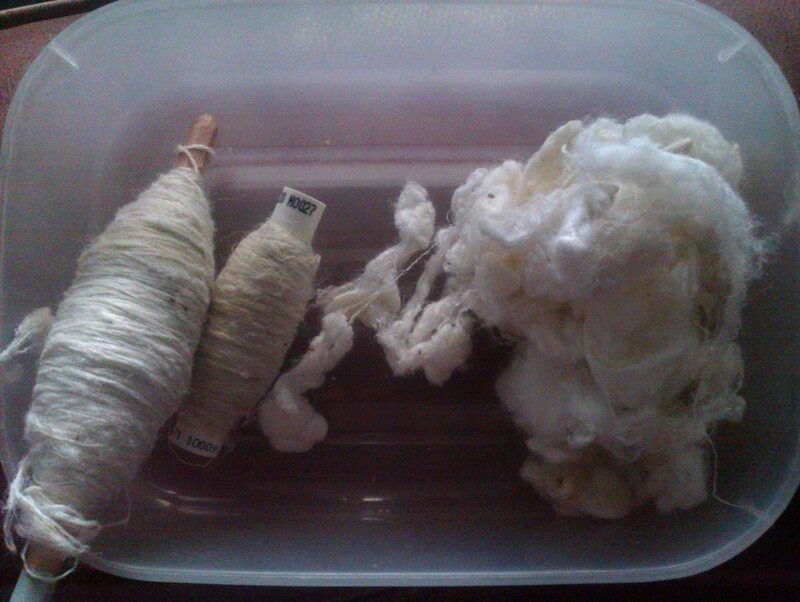 While this is happening prepare some new plastic underlay for the container. Pick up the new netting (this will have new food and the worms on), place on the side whilst throwing away old food and worm waste (you will able to remove the old plastic overlay to do this) and replace with new plastic. 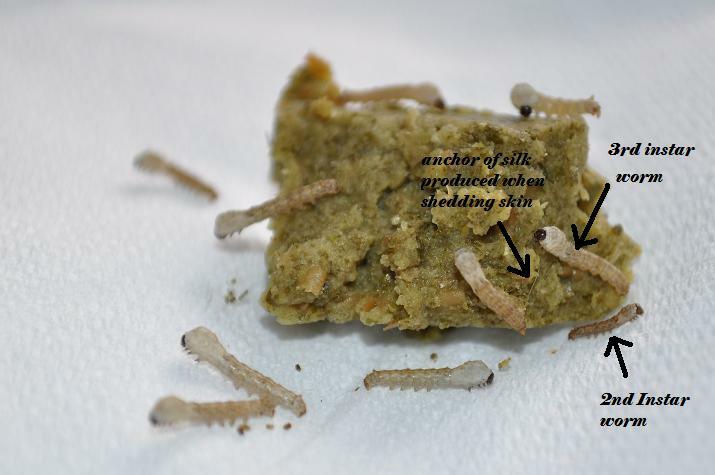 Feed the worms at least once a day with mulberry chow/ leaves- this varies at different instars stage- worms require more food as they grow bigger- and a larger hole can be cut at the tip of the piping bag to allow for this. Worms will be stationary with the top half of their bodies raised upward like they are saying a prayer, the worms are ready to shed their skin for the next stage of development. When most of the worms are in this position they should not be disturbed. This is what i like to call the food dance. The worms frantically wave the top half of their body up in the air – this is where they are looking for food, this will indicate that they are hungry and need more food.